Speaking of the Gay Geeks and Gaymers tumblog, I just saw the Mario Kart-inspired t-shirt design below (order shirts bearing the design here) while scrolling through it. 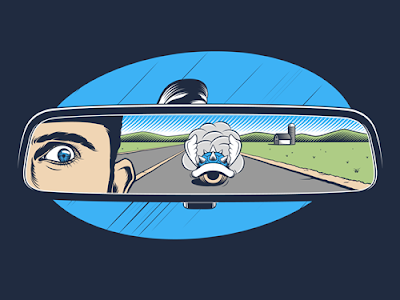 Nintendo should have included one of these shirts with every copy of Mario Kart Wii, don't you think? Or would it have hit too close to home for players of that game? Regardless, it's certainly an image I can relate to--since I've been eviscerated by many a blue shell while playing the last entry in the Mario Kart series. Honestly, I wish they would take that stupid turtle shell out. Bleh! I pretty much agree, Famicom Freak. The other power-ups do plenty of damage, IMO -- and the blue shell tends to do *too much* damage! You posted this on your tumblog, Justin? Damn, I guess I haven't been to it in a while. I wonder if the guys at Gay Geeks and Gaymers got it from you?? Anyway, YES, the problem isn't necessarily the blue shells, it's the CPU-controlled characters along with them. UGH! Hello there sir! nice blog! =D hope you can visit mine also and follow back! keep it up ! Oh, and BTW, I got over 90% of my hatred toward Mario Kart Wii. I came home from work and some friends were playing it with Robb, and I thought, "You know what? That looks fun again." And I promptly blew through the 150cc tracks and won golds on all but 1...still working on that. But I unlocked Daisy finally! Oh, that's great news, Justin! I understand why you got so pissed at the game, BTW. I developed similar feelings toward the game for a while thanks to the "cheap AI" that does its best to ruin the later stages of the game. That said, I absolutely can't wait to give the 3DS version a try. It looks amazing! The blue shell has become such a signature and staple part of Mario Kart now, that I don't think Nintendo will remove it. The T-shirt signifies it's iconic status, whether we love it it hate it. Part of me likes that it puts a bit of fear in whoever is in first place and that it can completely change the dynamic of a race. But another part of me hates how overpowered it is and that it seems easier to acquire with each Mario Kart game that comes out. It was so RARE in Mario Kart 64 and there was also no guarantee it would even hit the person in 1st place. But now, you could be in 4th or 6th place and get it frequently. Nintendo either need to make the blue shell harder to get or put an option in the game which allows you to race with that item switched off. Hey there, J! Yeah, I agree with you: It's far too iconic for the folks at Nintendo to remove it from the MK games entirely. I do think, as you do, though, that they could make it harder to get. Also, I much prefer the way it used to work (skimming across the ground rather than flying through the air) to how it works now. The good news, of course, is that I'm pretty sure the blue shell included in MK7 harks back to the olden days and skims across the ground.